In a landmark ruling on Wednesday, the San Francisco Board of Supervisors passed a measure stating that cetaceans, or whales, dolphins and porpoises, have the right to be free from life in captivity. The resolution states that the animals deserve "to be free of captivity, and to remain unrestricted in their natural environment." It was backed by both San Francisco Supervisor Scott Wiener and sponsored by Earth Island Institute's International Marine Mammal Project. As its rationale, the Board cited the complex emotional and intellectual capacities of cetaceans, as well as the documented psychological stress and high mortality rates caused by captivity at marine parks like SeaWorld. The resolution is the first of its kind in the U.S.
San Francisco Animal Control and Welfare Commissioner Russell Tenofsky first introduced the resolution to the Commission earlier this year. "The San Francisco Board of Supervisors did a wonderful thing in recognizing that cetaceans have the right to be unrestricted and free from captivity," he said in a statement. "Hopefully other municipalities will follow suit and provide even further rights and protections for whales and dolphins." Conservationists have praised the move as a milestone for marine mammal rights. "This resolution reflects an understanding that what we once believed about dolphins and whales – that they are unthinking automatons – is in fact false, and that they deserve to be free," says Laura Bridgeman, Campaign and Communications Specialist of the International Marine Mammal Project. "Our laws should be increasingly informed by this knowledge. This is resolution is a step in the right direction." It may be the first of its kind, but San Francisco's resolution isn't the first attempt to protect cetaceans in captivity. In March, a New York Senate Committee approved a "Blackfish bill" to ban any future parks from keeping orcas in captivity in the state. In June, the U.S. Congress unanimously passed a monumental law to protect captive orcas and other marine mammals. And in California, a state that currently holds ten orca whales in captivity at SeaWorld San Diego, a bill was introduced earlier this year that would prohibit the captive display of orcas in California and retire those currently held in captivity to a sea pen on the coast. Dubbed the Orca Welfare and Safety Act (AB 2140), the bill is currently under interim study to examine the feasibility of sea pens for the potentially soon-to-be-retired animals. Another California city, Malibu, also passed legislation this year proclaiming that all cetaceans that pass by its coast have the right to life. San Francisco's newly-passed resolution is not exactly a ban like the proposed Orca Welfare and Safety Act, Bridgeman of the International Marine Mammal Project told The Dodo. "While the resolution is non-binding, it is significant because never before in California history have any cetacean rights been recognized," she said. 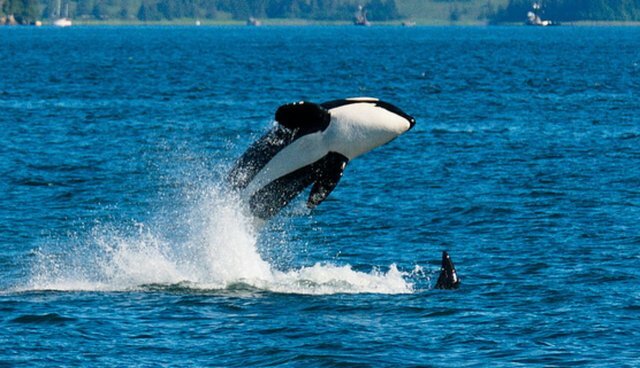 "We do believe that it's going to boost the chances that the orca bill will be adopted, especially if other cities follow suit. With each resolution that gets passed, it becomes more and more difficult for SeaWorld to claim that cetaceans belong in captivity." Sam Berg, a former SeaWorld trainer who appeared in the documentary "Blackfish," told The Dodo that the measure could lead to "an outright ban on whale and dolphin captivity in the U.S."
"I think this recent development sends a strong message to the California Assembly that California citizens care about the rights of whales and dolphins and that the Orca Welfare and Safety Act should pass," she added.